Sydney Kumalo was born and grew up in Johannesburg. He studied under Cecil Skotnes at the Polly Street Art Centre from 1953, and with sculptor Edoardo Villa in 1958–59. He was employed as a teacher at Polly Street (and then the Jubilee Social Centre) in 1960, serving as an important influence on a generation of younger sculptors. His first solo exhibition took place in Johannesburg in 1962, and the following two years saw him exhibiting as part of the Amadlozi Group, founded by the dealer Egon Guenther, alongside Skotnes, Villa, Ezrom Legae and others. He was able to devote himself to art full-time from 1964. Kumalo would model his sculptures in terracotta, which was then cast in bronze. The casts in this catalogue date from 1966, a momentous time in Kumalo’s career. In this year he had a solo exhibition at the Egon Guenther Gallery in Johannesburg, his work was included in the South African pavilion at the Venice Biennale and he held a joint exhibition with Cecil Skotnes at the Grosvenor Gallery in London (he had previously exhibited there in 1965 on the group exhibition Fifty years of sculpture). A flyer for the latter exhibition indicates that the pairing of Kumalo and Skotnes was intended to illustrate to London audiences the interplay between Western and African styles in modern art, with comparisons drawn between Kumalo’s work and the Reclining Nudes of Matisse. These bronzes were all cast by the Fiorini & Carney Foundry, London, for the Grosvenor Gallery in the mid-1960s for the joint exhibition at the gallery which ran from 12 July – 6 August 1966. According to gallery records, in most instances only a small number were ever cast and the editions were not completed; in the case of Beast with Mane and Reptile, only two of each were cast. The works were again shown by the Grosvenor Gallery in 1995, on the exhibition Art from South Africa c1917–1980. 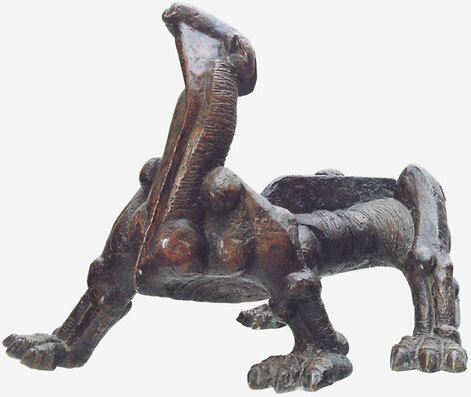 The bronzes illustrate Kumalo’s lifelong preoccupation with both the human form and that of the beast, the two often fused. His animals are mythical, slouching beasts whose limbs embody pent-up power, while his pregnant and seated women exhibit a solidity in their forms which tie them strongly to the earth. Elizabeth Rankin quotes the sculptor saying, ‘The African people are a heavy people and I’ve always admired this heaviness’ (Images of metal, Johannesburg, 1994, p130). The only sculpture out of this group that is widely known is Praying woman: this is the smaller, delicately proportioned prototype of his 1960 sculpture for the Union Pavilion at the Rand Easter Show (Images of metal, cat 30; and Elza Miles, Polly Street: the story of an art centre, Johannesburg, 2004, fig 84, p71).